Campaigning against pollution is a the heart of the Green movement right from the days of Silent Spring which woke millions up to the problems of pesticides (sadly it is not a battle that we are winning, pesticides are being implicated for the 75% decline in flying insects in the past 25 years). The Lancet study shows that 8% of UK deaths are attributable to pollution equating to 50,000 people each year or 140 every day. The recent LA shooting killed 59 people yet more than double that number are dying every day in this country. Where is the action to tackle this? The solutions are with the government, corporations and the rich yet the impacts are most heavily felt on the poorer people in society. Globally this is quite stark. 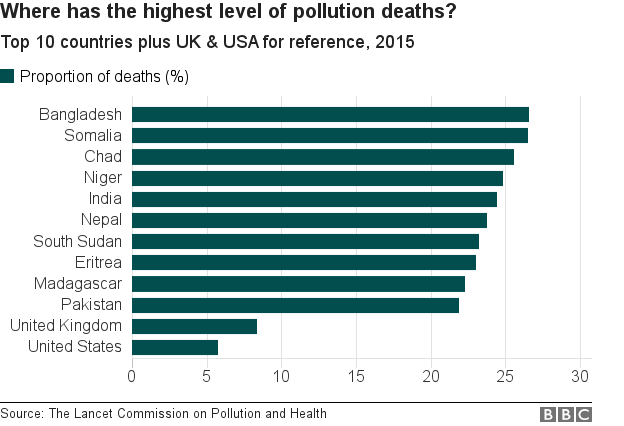 One in four deaths in Bangladesh are attributable to pollution which 1 in 12 are in the UK. Even in the UK we know that air pollution, one of the biggest components is focused in poorer areas. Meanwhile the government cannot be bothered to come up with a plan, big business gets away scott free with deceiving the public and people continue to die needlessly.